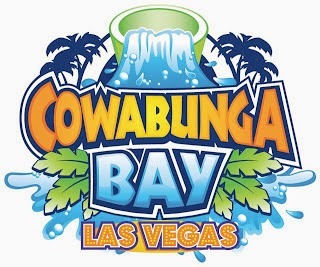 Home » cowabung water park , cowabunga , henderson water park , las vegas » Cowabunga! 23-acre water park off Galleria Drive. 200 tons of steel are supporting each one of the 8 water slides. There are also three pools, a kids cove area and cabanas for rental with their own pool area. Three eateries, Cowabunga Chill, Bullwinkle’s Boardwalk Grille and Rocky’s Beachside Cafe. There are 3 themed zones inspired by the surf and beach scene of the 1950's and 60's. With a total of thirty attractions including a 35,000 sq ft wave pool (one of the largest in Nevada), a Lazy River, a themed children water playground structure (with a dozen of mini-slides) and three waterslides complex. Among these waterslides, there are 6-lanes Multislide (mat racer type with an original upward slope at the end of the path), a Space Boat (raft slide ending by a whirl), a Looping Rocket (high speed slide with an horizontal 360° helix and a launched start through a trap door) and a Space Shuttle (raft slide with giant cylinders). In addition to the slides and attractions, there are two restaurants at the park and offer rental of private cabanas. Cowabunga Bay is located in Henderson east of the Galleria Mall. From the US-95 (I-515) exit east on Galleria (exit 64B) and head towards the park. The +Huish family owns the copyrights to the famous 1960s cartoon characters. Just in case you don't know (I didn't), +Cowabunga means "positive, good, great, mostly used by headbangers, skaters, surfers.